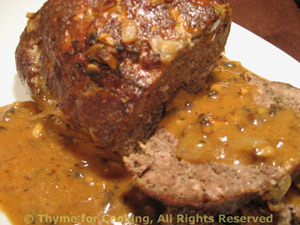 Meat Loaf with Mushrooms Sauce, Thyme for Cooking gourmet cooking. 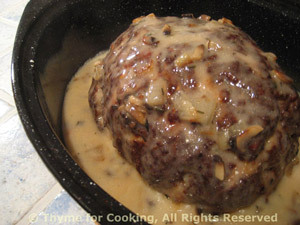 Classic meat loaf paired with a creamy sauce made from field mushrooms. You can use any ground meat or combination. Mince onion as finely as possible. In large bowl lightly beat egg with a fork. Add onion, red wine, mustard, crumbs, herbs and mix well. Add beef and pork, mix well - best to use your hand, kneading it like bread dough. Shape into a loaf and put into a roasting pan large enough to hold it with room on all sides. Bake at 400F (200C) for 40 minutes. Remove and pour mushroom sauce over the top. Sauté in oil, in medium skillet, until tender and well browned. Dissolve cornstarch in water and add to chicken stock, stirring until thickened. Remove from heat and stir in yogurt. Set aside until needed.